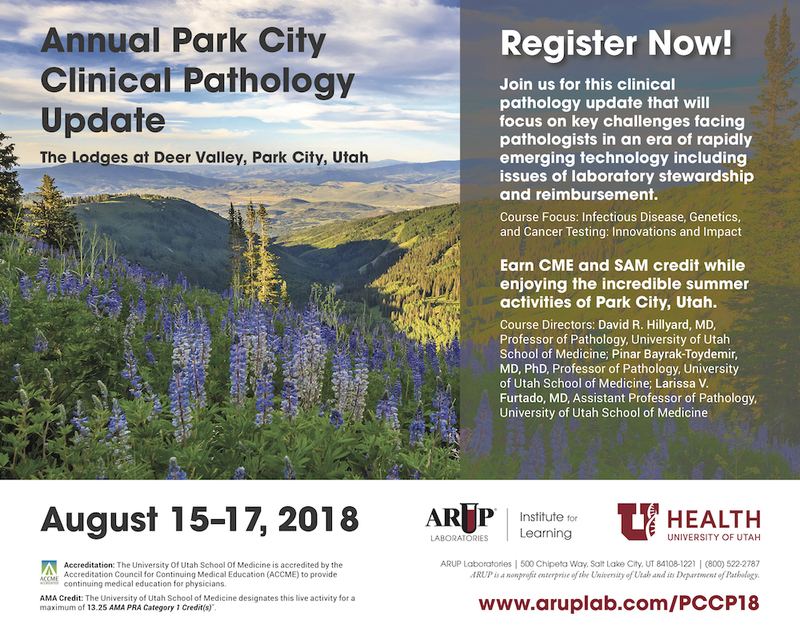 Thanks to Dr. Ayesha Azam, University Hospital Coventry & Warwickshire (UK) for contributing this case and Dr. Hillary Zalaznick, Myriad Genetics, Inc., Utah (USA) for writing the discussion. To contribute a Case of the Week, first make sure that we are currently accepting cases, then follow the guidelines on our main Case of the Week page. (3) Jobs page: you can get search US jobs by region and subspecialty together (drop down menu is at the bottom of the Table of Contents), as well as by individual location and subspecialty. A 71 year old woman presented with atrial fibrillation. Upon investigation, a mass was seen in the left atrium, which was excised. The specimen was a solid nodule that measured 6.2 x 5.5 x 2.8 cm and weighed 38 g. It had a smooth, glistening grey-white surface. A suture was present on one polar aspect, indicating the site of attachment to the atrial septum. At the attachment site was a round sheet of fibrous tissue which measured 1.2 x 1.0 cm. The cut surface was solid, gelatinous and light yellow with a rubbery consistency and a few hemorrhagic areas. Which of the following favors a diagnosis of cardiac myxoma over papillary fibroelastoma? 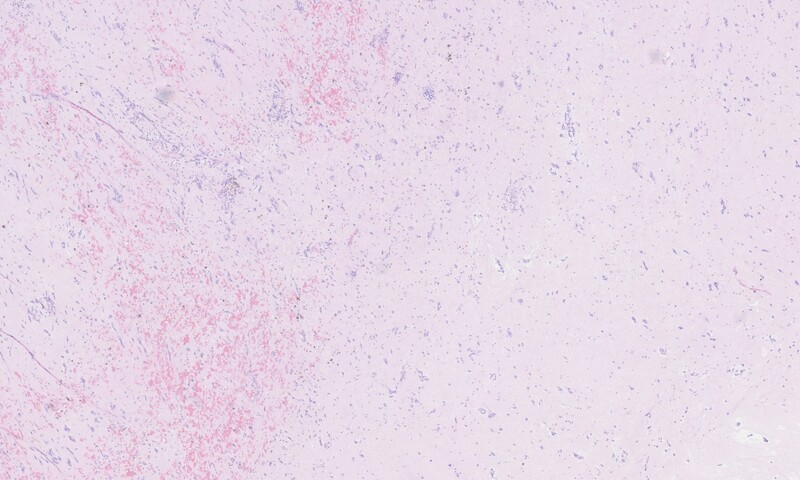 Sections from the tumor show bland cells with oval-round nuclei, abundant eosinophilic cytoplasm and indistinct cell borders embedded in a myxoid stroma. This is consistent with a cardiac myxoma. 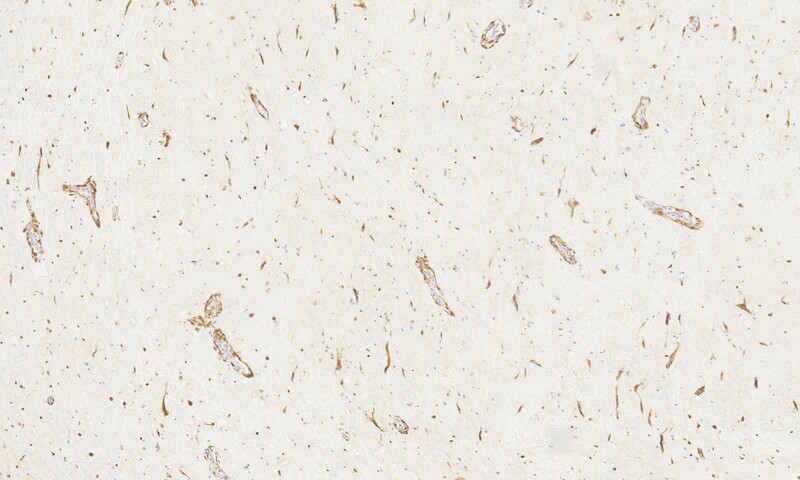 The diagnosis is further supported by positive staining for calretinin. 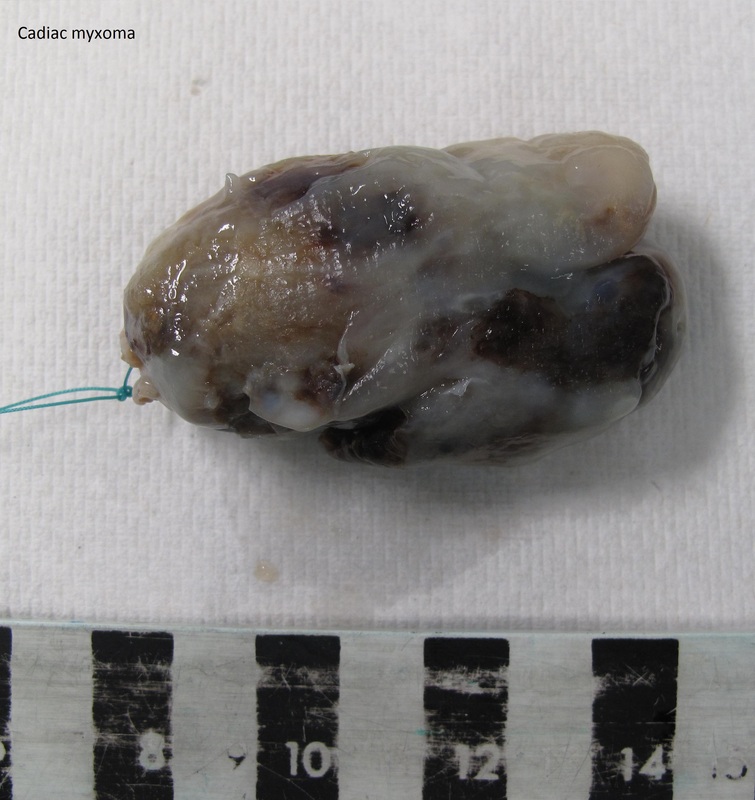 Cardiac myxoma is a benign tumor distinct from myxoma at other locations. It is usually located in the left atrium (~75%). The presenting symptoms depend on the location of the tumor and include arrhythmia, valve dysfunction and emboli. There can also be constitutional symptoms such as fever, weight loss and anorexia. Grossly, cardiac myxomas can have a smooth or friable surface and can grow as large as 10 cm. The cut surface can be gelatinous or show fibrosis and degenerative changes such as hemorrhage. The attachment to the endocardial surface can be narrow or a broad stalk. The origin of the tumor cells is uncertain, but they are thought to arise from multipotent cells of the embryonic endocardial cushions. 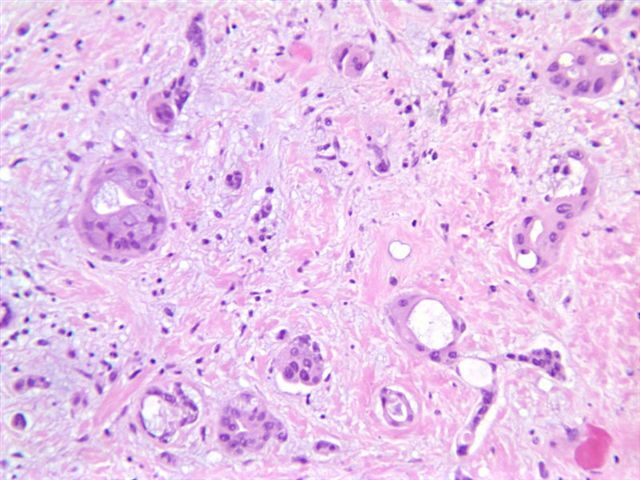 The tumor cells grow singly or in nests, cords and ring structures. The cells tend to be located near capillaries and sometimes appear to merge with them or surround them. The ring structures have an acellular halo (seen in second H&E image above). 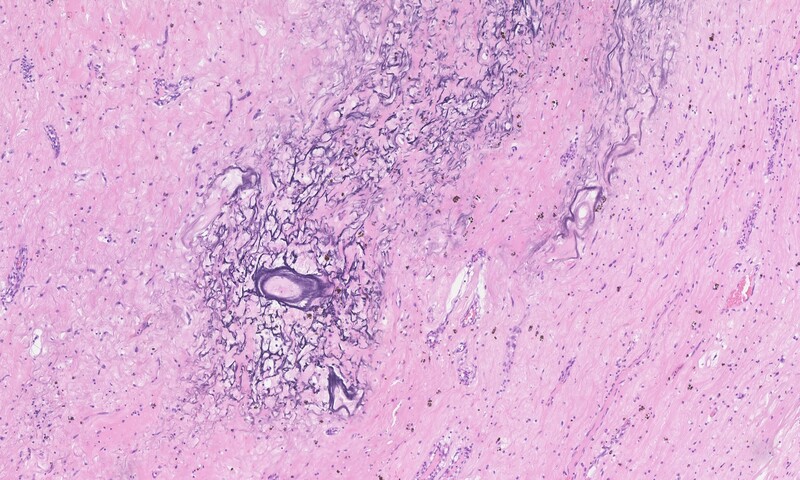 Numerous small thin-walled and a few larger blood vessels are seen, as are lymphocytes, hemosiderin-laden macrophages (seen on Perls iron stain above), plasma cells and mast cells. 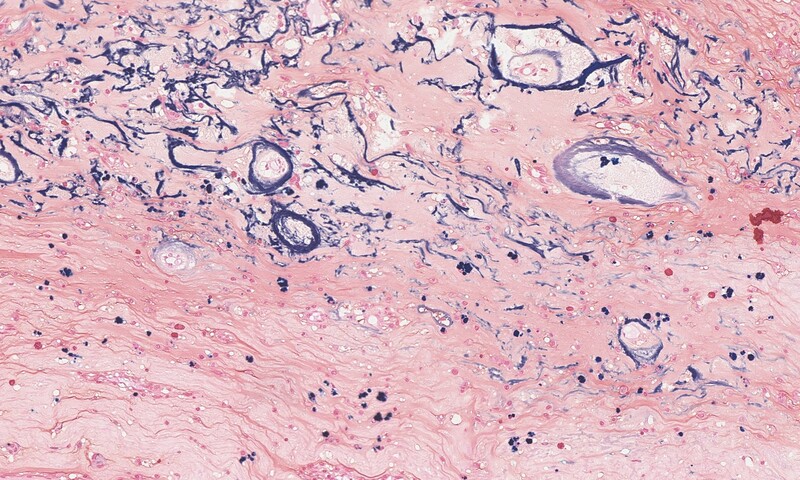 There are often degenerative changes present including prominent elastic fibers encrusted with iron and calcium (Gamna-Gandy bodies, also positive on Perls iron stain shown above). Cardiac myxomas can also calcify or ossify and 7% show extramedullary hematopoiesis. Oddly, 1% of cardiac myxomas contain benign intestinal-type glands (Wick: Silverberg's Principles and Practice of Surgical Pathology and Cytopathology, 5th ed, 2015). 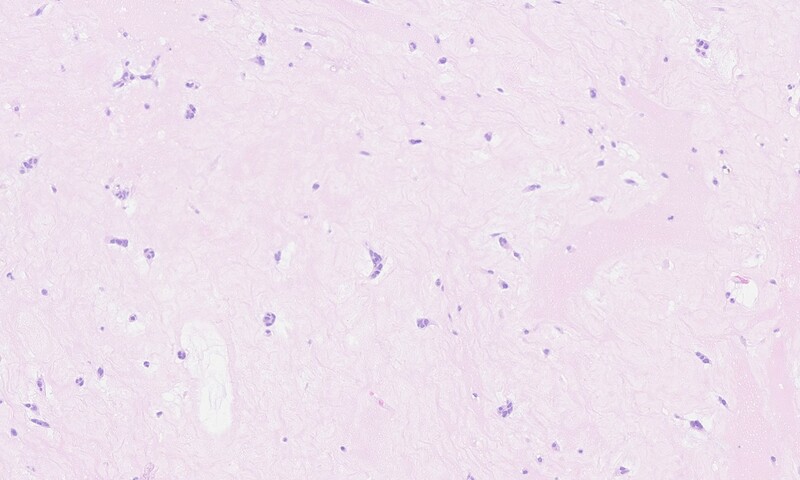 Most cardiac myxomas are sporadic, but up to 10% are part of the Carney complex, an autosomal dominant disorder characterized by a constellation of myxomas (both cardiac and extracardiac), endocrine tumors or overactivity, spotty skin pigmentation and other uncommon tumors such as psammomatous melanotic schwannoma and large cell calcifying Sertoli cell tumors. The cardiac myxomas in patients with Carney complex can be multiple and arise in uncommon locations such as the valves and ventricles. Approximately two-thirds of patients with Carney complex have heterozygous inactivating mutations in PRKAR1A, a tumor suppressor gene that inhibits protein kinase A (PKA) through its catalytic subunit PRKACA. There are conflicting studies about whether PRKAR1A mutations are present in sporadic cardiac myxomas; most have not identified mutations, but a study by Maleszewski et al showed loss of PRKAR1A expression in 33 of 103 sporadic cardiac myxomas by IHC and mutations in PRKAR1A in 9 of 29 cases that had negative IHC expression (Am J Surg Pathol 2014;38:1079). Other alterations in the same pathway are likely involved in a subset of cardiac myxomas; for example, a study by Tseng et al identified mutations in PRKAR1A in 4 of 41 sporadic cardiac myxomas (J Pathol 2017;242:134). However, the genetic driver(s) of most sporadic cardiac myxomas is unknown. The differential diagnosis for cardiac myxoma includes papillary fibroelastoma and myxoid cardiac sarcomas. Papillary fibroelastoma, also called giant Lambl excresence or fibroelastic papilloma, is usually an incidental finding. It can appear myxoid but differs from cardiac myxoma by being most common on the mitral valve and by having avascular papillae. 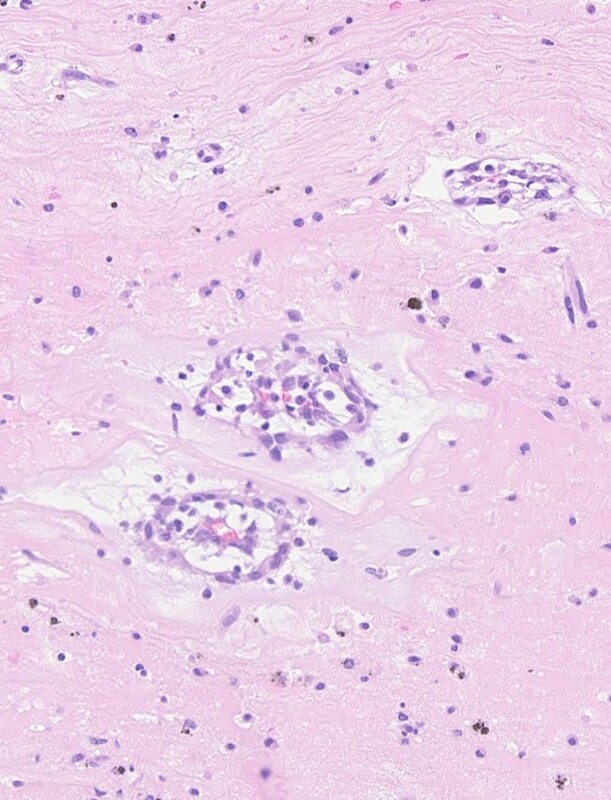 Cardiac sarcomas can be differentiated from cardiac myxoma by nuclear pleomorphism and atypical mitotic figures; additionally sarcomas are typically negative for calretinin staining, in contrast to cardiac myxoma. Metastatic adenocarcinoma may be a consideration for cardiac myxomas with intestinal-like glands, but the glands seen in cardiac myxoma are not atypical. 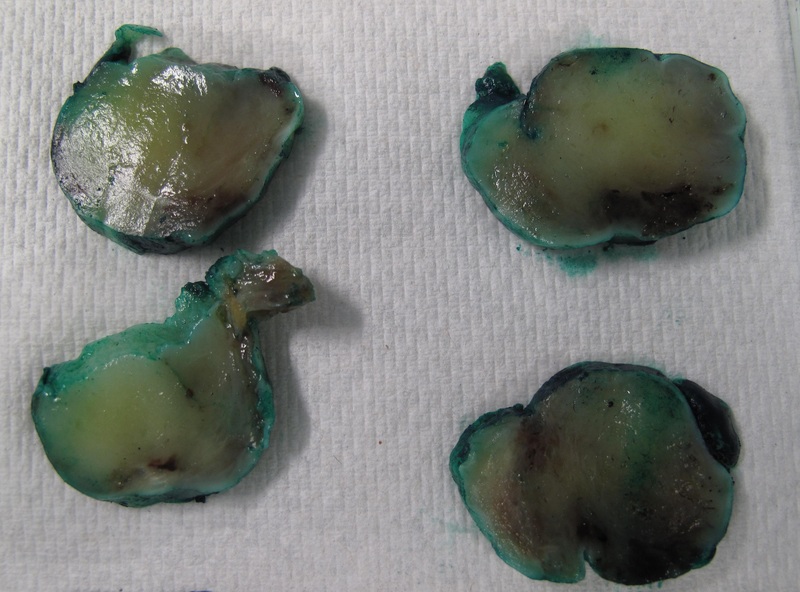 Cardiac myxoma is treated by surgical excision. Sporadic cardiac myxomas only rarely recur (<2%), but those associated with Carney complex recur more frequently. A. In cardiac myxoma, cells form ring structures around capillaries. In papillary fibroelastoma, the papillae are avascular.